My love of craft beer, however, started while in graduate school at UC Berkeley. I’m forever indebted to my friends, Ellen and Rupinder, and Bobby G’s Pizzeria. Little did I know just how lucky I was to have Deschutes Mirror Pond consistently on tap until I moved from Berkeley to NYC! You can guess what one of my go-to beers is every time I’m home in Southern California for the holidays. From my introduction to craft beer a few years ago, my interest in and engagement with this industry has only grown. In July 2015, I packed up my life as a Marketing Manager at an organic babyfood company in NYC and moved to London to get into the craft beer industry. I was lucky enough to land a job as a bartender at Mother Kelly’s in London and it was there that I realized the incredible role I play as a beer advocate. Without a bottle to read, most consumers make their decisions based on a the brewery name, beer strength, or a few-word style description that can’t possibly convey a beer’s depth of flavor or the brewer’s hard work or inspiration. With the wheels already turning, a conversation with Jon Buford & Patrick Ware of Arizona Wilderness Brewing Co. at the incredible Rainbow Project event at Beavertown Brewery made me realize I had to create this website. 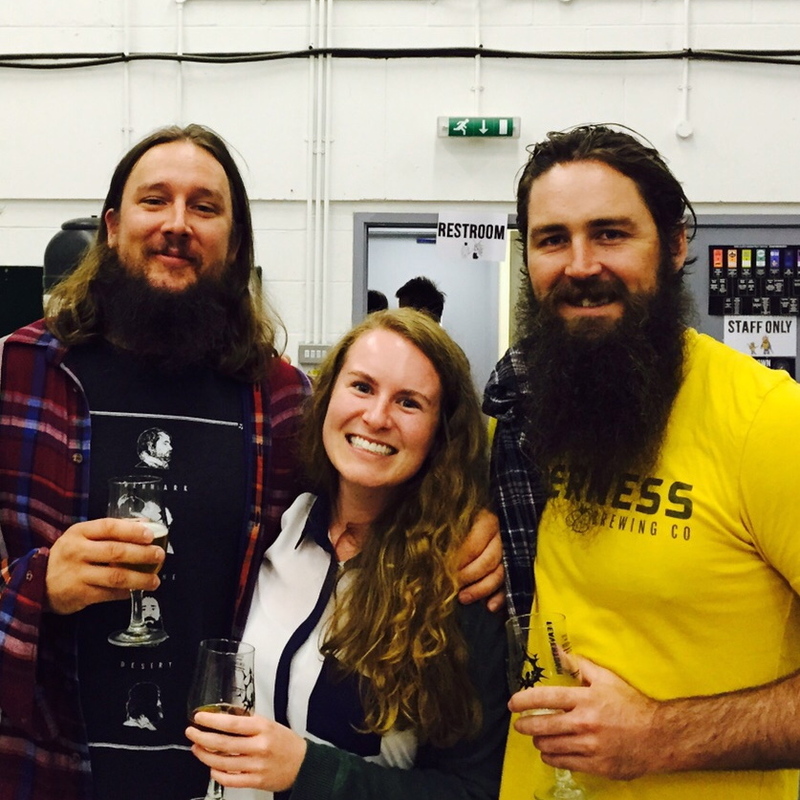 Rainbow Project 2015 at Beavertown Brewery with Jon & Patrick from Arizona Wilderness Brewing Co.
Jon & Patrick felt that sharing their beers here in London was an opportunity to share “Arizona in a glass.” As those of us from the States know, Arizona is often seen in a certain political light, so the guys at Arizona Wilderness took it upon themselves to include locally sourced ingredients, push boundaries with their recipes and create a beverage that would make a statement. That is what craft beer is all about. And these are the stories I want to share. I have so much passion for craft beer (as if you can’t already tell! ), so I hope you’ll indulge me and geek out a little yourself. Brooklyn Brewery’s Garrett Oliver at Mother Kelly’s in London. Mikkel Borg Bjergsø at Mikkeller Bar San Francisco. Questions, feedback, stories to share? Please don’t hesitate to get in touch! P.S. It’s worth noting that while my interest in beer fits hand-in-hand with my undergraduate degree in microbiology, my graduate degree in public health does not always pair so well with my love of this craft. Excessive alcohol consumption can lead to an increased risk for health problems and is a major public health concern. For more information, check out these great resources from the Centers for Disease Control & Prevention. Please always drink responsibly.